The Carolina Hurricanes named Justin Williams team captain over the weekend. My colleague, Mark Shiver, astutely noted that this ended a dual-captaincy model between Justin Faulk and Jordan Staal which left both men equally displeased. Beyond solving this one awkward personal dilemma, naming Williams captain marks a clear stamp from first-year head coach Rod Brind’Amour. Never one to shy away from a battle during his playing career, it is clear that this move sends a few messages to the hockey world in general, and, more importantly, to the men in the Hurricanes dressing room. 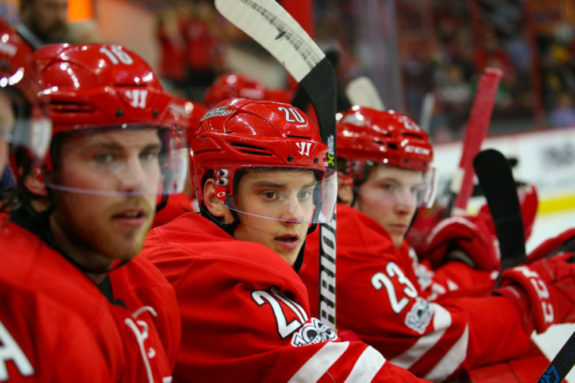 Naming Williams captain continues a string of moves that the Hurricanes organization has made this summer that informs onlookers that they are going to play with grit, and a physicality that makes opponents’ lives uncomfortable. Carolina ranked 28th in hits, 31st in blocked shots, last in penalties taken per 60 minutes, and 27th in penalties drawn in 2017-18. Taken together, these statistics are indicative of a team that was soft, and that is going to change in 2018-19. In changing the ethos in Carolina, there was first the move of Jeff Skinner, who for all of his skill on the puck and sweet skating, was never going to be a player that made opponents physically uncomfortable. Brind’Amour was never going to accept this, which is part of why he was not bothered by Skinner being traded for a relative pittance. Brind’Amour is clearly trying to mold the Hurricanes into a cast of talented youngsters with an edge to their game. Brind’Amour himself was an all-around player, winning the Selke Award twice, and gaining fame for working out so hard in college that Michigan State officials had to change the locks in order to stop him from working out constantly. Naming Williams captain is a great second step in implementing his tough-nosed, aggressive approach to the game. There are few players as respected around the NHL as Williams. The man is the consummate professional, which is a big part of why the Hurricanes brought him back into town in 2017. Every single player in the locker room could learn from his approach to the game. You may ask, are Faulk and Staal not also consummate professionals? The obvious answer is that they are both good players and worthy of emulation in their approach to the game, but neither carries the cache that Williams does. Mr. Game 7 is a moniker that Williams earned, and the Hurricanes would love to hand him the opportunity to score another series clinching goal. Now, instead of looking to two men, the youngsters in the Canes locker room will be able to lean on Williams when things get tough. The Canes projected roster has an average age of 24.92, and there are going to be many times when Martin Necas, Andrei Svechnikov, and the other youngsters in town do things that remind you that they still have a lot to learn. In naming Williams as captain, Brind’Amour has just sent a message to the other 23 guys in the locker room as to whom they should be looking to for leadership. Faulk and Staal will still be there as assistant captains and provide a model to follow, but Williams will be the one with whom the buck stops. That should comfort fans in Carolina. It is no secret that Hurricanes owner Tom Dundon is considering relocating the franchise, with Houston, Kansas City, Seattle, and Quebec City all lining up. Yes, I know that Gary Bettman has repeatedly denied that the organization would be leaving town. I also remember how Bettman protected the Atlanta Thrashers. Wait, the Winnipeg Jets? Attendance at PNC Arena went down for four consecutive seasons after the 2012-13 season, although average attendance did climb to a still-paltry 13,321 in 2017-18. Average attendance in Atlanta was 13,469 during their final season, if you wish to continue to draw out that grim parallel. The NHL is a business, and Dundon is a businessman. A smart one at that. 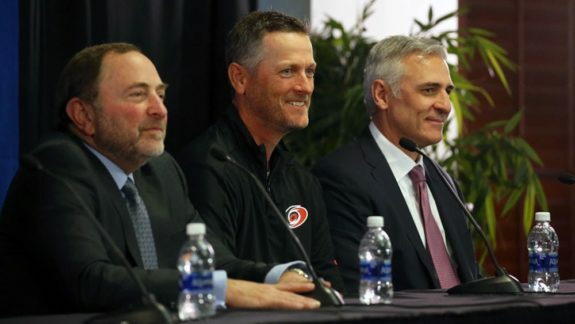 Everyone around the organization knows that the lease at PNC Arena only runs through 2024. The writing is on the wall here, and Dundon is not going to let the paint dry. Dundon is also a Mark Cuban disciple, and has professed a desire to make the team consistently competitive. Stability for professional sports franchises is premised on the idea that markets are an attractive place for players to spend their entire career, and for free agents to come to. A lack of a clearly defined permanent home undermines any semblance of stability, dissuades people from paying ticket prices, and turns off free agents. This is essentially the formula that drove John Tavares out of Long Island. No, Williams adding a ‘C’ onto his jersey is not going to instantly attract 4,000 more people out to PNC Arena. 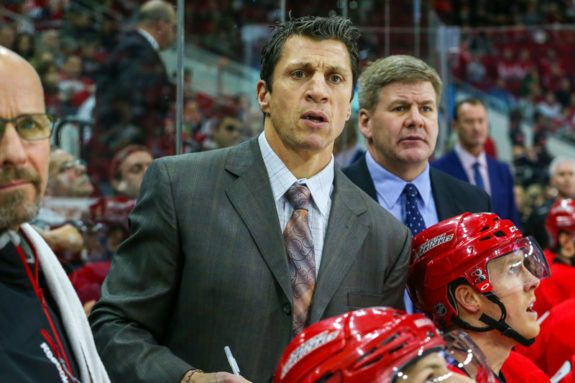 But now, with Williams as captain, Brind’Amour can begin to get the Hurricanes to play a focused, disciplined, and relentless style of hockey. The change in playing style will make the Hurricanes a tougher team to play against, and will lead to more victories. More wins typically means more butts in the seats and adds more revenue into the coffers, which in turn would make it harder for Dundon to move the franchise. If the good results ensue, the organization will be more attractive to free-agents, more likely to retain their burgeoning stars for the long haul, and they will fly off the ranks of professional sports franchises most likely to be relocated. But no pressure there, Justin Williams.